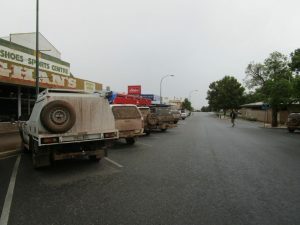 We had a group of 7 vehicles participate in the Yabby R & R weekend in Blanchetown. This included 3 visitors, who were all lovely to meet. Welcome to Bill and Erica; Maria and Greg; Peter and Elaine. It was great to have you join us. Club members attending: Peter and Lynne, Les and Eileen, Steve and Deb, Wal and Kerry. Saturday was spent setting up camp and getting some practise at relaxing. It takes a lot of training to get into form! Peter and Lynne travelled to town to buy ant spray as the little black blighters were everywhere. The only safe place was on a chair with your feet up (after spraying the chair legs) or in the river swimming or canoeing. Les, Bill and Erica went for a leisurely(?) 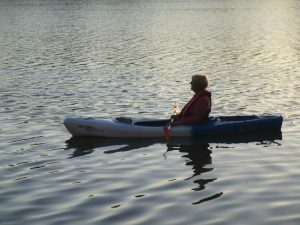 paddle and returned 2 hours later having travelled 8 km. Well done! Maria went for a walk and took some photos of the camp from the cliff top – you may have seen them on Facebook. Steve, Deb, Peter and Wal tried to catch fish but…usual story with the Murray… nothing but carp. On Sunday we went for a drive south to Big Bend where a shower of rain caught us. 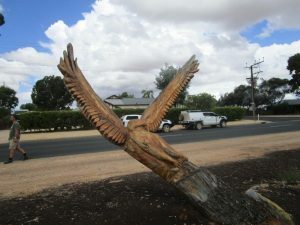 We turned east to Loxton and very soon had the wipers on most of the way. 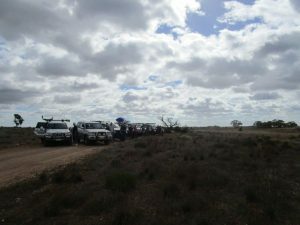 Dirt roads meant 4WD was engaged as it was a touch slippery on the dirt, but it added to the fun. We found a bakery in town but as it was after 1pm, the stock was depleted so some dined at the pizza bar. No shelter could be found so we put up the chairs on the footpath in front of a business that was closed for the day, much to the amusement of the locals. Bill and Erica left us to head for home (a prior engagement on Monday). 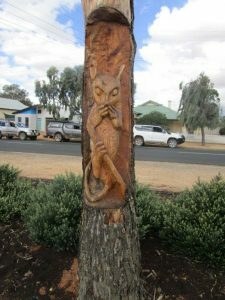 The rain had cleared so we paused to view the carvings made from Pine tree stumps that once grew in the main street – rather creative. I couldn’t find a plaque advising who the artist was. When we returned to camp, it was dry; not a drop of rain – which meant that the ants were still very busy. The yabbying was successful with Greg taking the largest haul in one net. 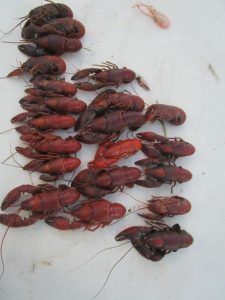 These were cooked up in the hot water bucket, along with others caught prior, and enjoyed by some. Peter and Les left to go to the drags for the night and reported a good time was had. Those of us back at camp stoked the fire up as it was getting a bit cool and Peter regaled us with stories of his experiences in the services. Monday was departure day for most of us and we packed up and left, one by one. All in all, it was good, relaxing weekend with nice people and we had four seasons in the weekend – but it wasn’t the weather that was the bane of us all, it was the BLOODY ANTS! I have been assured that this is what usually occurs after a flood covers the river banks and they should be back to a reasonable level next year.